The deal was announced just hours after the 169 year-old chain went into administration when talks with its creditors failed to reach an agreement. Its 59 shops were expected to open on Friday, including the 31 that had already been marked for closure. It employs 16,000, 5,900 directly and 10,100 in concessions. Administrators said jobs could be “preserved”. Mike Ashley already held an 11% stake in the department store chain and it was not clear what his plans were but they could include rebranding some stores as Sports Direct. Which High Street shops are opening and closing? House of Fraser’s administrators, from accountants EY, said the retailer had been in “a race against time to secure sufficient funding to secure its future” ever since the Chinese firm C.banner pulled out of a rescue deal earlier this month. Alan Hudson, one of the four administrators from EY, said the Sports Direct deal “preserves as many of the jobs of House of Fraser’s employees as possible”. “We hope that this [deal] will give the business the stable financial platform that it requires to flourish in the current retail environment”. But union officials at Unite said staff were entering “a period of great uncertainty and worry”. Before Friday’s deal was announced, 6,000 roles were to have been lost in the restructuring plan which included the store closures. While some stores did not open on time on Friday, initial problems with the website were resolved. There were reports, though, that gift cards were not being accepted. On Thursday, House of Fraser had indicated time was running out whens it wanted to secure financing by 20 August. This is the date when payments were due to concessions inside the House of Fraser stores. Nigel Lugg, group executive chairman of Prominent Europe, which supplies Chester Barrie menswear to House of Fraser, said it was “good news” that the business had been saved. But, he said, suppliers will have hoped the business would avoid administration so they could be paid in full. “I can’t see the suppliers getting a lot of money out of the system,” Mr Lugg told the BBC, adding suppliers often received 2p to 3p in the pound in cases of administration. His business would be fine but, he said, “it could impact into other UK suppliers”. “There is a lot of money trapped in the system,” Mr Lugg said. House of Fraser has two main types of relationships with its suppliers: wholesalers who are paid in advance for their stock or concessions which are on a payment schedule when items are sold. Attention was turning to Mr Ashley’s plans for the stores. He has said that he wants to turn his Sports Direct fashion chain, which he founded in 1982, into “the Selfridges of sport”. As well as 750 Sports Direct stores, Mr Ashley has investments in Debenhams and French Connection, and he also owns the clothing chain Flannels. He will needed to spend more money on House of Fraser was to thrive, one analyst said. Sofie Willmott, senior retail analyst at GlobalData, said: “To give House of Fraser the best chance of survival, Sports Direct and its owner Mike Ashley must make drastic changes to both its product proposition and store environment to entice shoppers back”. She suggested Mr Ashley could take House of Fraser more upmarket by putting in some of his existing brands such as Agent Provocateur and Flannels, which sells brands like Burberry London, Fendi and Sophia Webster. But, another analyst said, House of Fraser was more likely to become more downmarket. 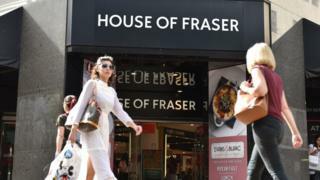 Other contenders to take over House of Fraser had included Mike Ashley’s retail rival Philip Day, who owns the Edinburgh Woollen Mill chain, Jaeger and Austin Reed. The administrators at EY confirmed that “a number of parties” had been spoken to since C.banner walked away. C.banner had been poised to invest in House of Fraser after it agreed a Company Voluntary Arrangement (CVA) with its creditors, which would have closed 31 stores and put 6,000 jobs at risk. But it could not raise the financing, leaving House of Fraser seeking new investment. The administrators said they were appointed after it was not possible to achieve “a solvent solution” and House of Fraser filed for insolvency protection on Friday morning.